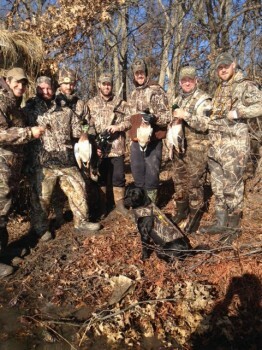 Linebacker Frank Zombo, fullback Anthony Sherman, punter Dustin Colquit, quarterbacks Chase Daniels and Alex Smith and long snapper Thomas Gafford after a cold morning shooting some greenheads on my ice covered marsh. Kicker Ryan Succup was nice enough to stand in the water to take the picture. The duck hunting has been a challenge this year with the early cold and ice. I look forward to a great late season. I also look forward hunting on Tuesdays with my new friends on their day off from the football field.